Please note that the content of this book primarily consists of articles available from Wikipedia or other free sources online. Fish and Wildlife Act of 1956 of the United States of America establishes a comprehensive national fish, shellfish, and wildlife resources policy with emphasis on the commercial fishing industry but also with a direction to administer the Act with regard to the inherent right of every citizen and resident to fish for pleasure, enjoyment, and betterment and to maintain and increase public opportunities for recreational use of fish and wildlife resources. Among other things, it directs a program of continuing research, extension, and information services on fish and wildlife matters, both domestically and internationally. It confirmed the position of Commissioner of Fish and Wildlife and a United States Fish and Wildlife Service in the Department of the Interior, and established a Bureau of Sport Fisheries and Wildlife and a Bureau of Commercial Fisheries. Reorganization Plan No. IV, October 3, 1970 (84 Stat. 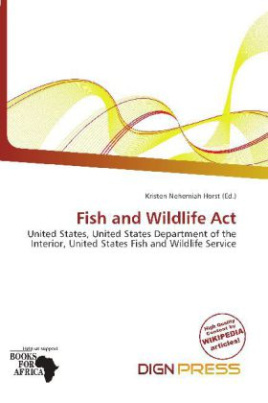 2090), abolished the Bureau of Commercial Fisheries and transferred functions related to commercial fisheries and marine sport fisheries, except Great Lakes fishery research and certain other fishery related activities.